With rapid population growth, food demand is projected to increase by 59-98 percent by 2050, according to the UN. Countries around the world are seeing large parts of their population graduate to the middle class, which calls for higher protein diets. As demand for resource-intensive protein production rise, and with more societal scrutiny around environmental costs, producers are forced to innovate and learn to do more with less. Our role, as an agricultural state, is becoming more vital to the global economy. As the world is drilling into how to address these new demands, we’ve seen a surge of interest in ag tech. “Precision agriculture” and “herd management” have turned into new tech terms, and now producers across the U.S. are harvesting data alongside their corn and soybeans. For a region whose businesses have been leaders in providing ag support services, a region that further represents two states whose economies proudly feed the world, it’s time for Omaha to take a look at what this means for our economy, and thus making ag tech the spotlight for Greater Omaha Chamber’s first Ag Council meeting of 2019. Hosted at Lindsay Corporation’s new corporate headquarters, our two Ag Council Chairs, Carrie Duffy of Black Dirt Realty and David Bracht of Kutak Rock, pulled together two rock star-filled panels. As new ag technologies have emerged, we’ve seen a potential shift in power. Farmers now have access to copious amounts of data instead of relying solely on the information provided by the companies selling the farmer products. However, Magnusson and Osborne emphasized it’s not as simple as that. Ag producers aren’t just looking for data, they’re looking for information to help them make decisions and mitigate risk. 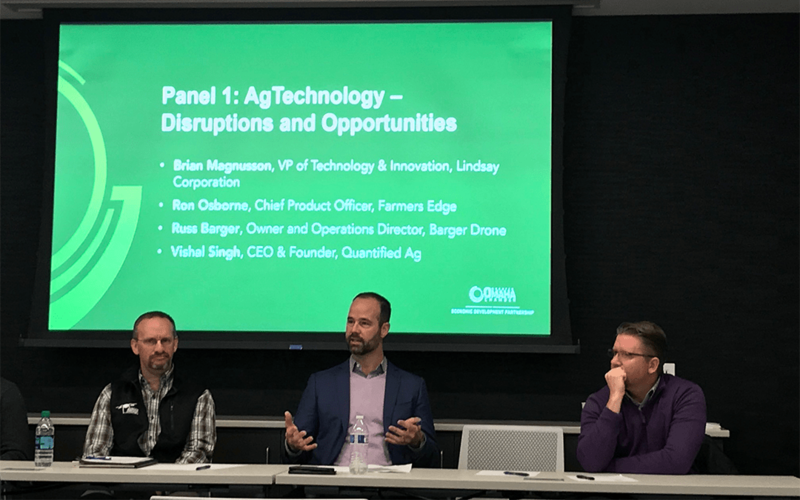 Our panelists agreed that while there are disruptive technologies, agribusinesses and agriculture producers value relationships – and technology can help provide information to make their existing relationships better. Barger added that these producers, particularly the ranchers he’s worked with, are community builders who care for and employ members of their community. Technology is allowing them to operate more efficiently and safely, without replacing their human capital or putting them at risk. Additionally, farmers and the agribusiness industry are finding new uses for data and technology. Singh shared that he created his biometric tracking cattle tag with the Midwest rancher and dairy producer in mind. He never expected that his technology would look like a promising health tracking solution for the thousands of live cattle that are shipped overseas from Australia. Agribusiness companies across the U.S. have seen the benefits these new technologies have provided. They realize now is the time to innovate, and have invested in and swooped-up a number of different ag tech companies. According to CB Insights, funding for ag tech startups in 2017 was $437 million, up 590 percent since 2012. How does Greater Omaha get in on this? How do we leverage our spot on the leaderboard as an ag state to also becoming a leader in ag tech? Our ecosystem seems to have all the appropriate pieces: high-quality entrepreneurs, an active investor community, startup support and research resources. The Engler Agribusiness and Entrepreneurship Program is developing a talent pipeline, while organizations like Invest Nebraska and Nebraska’s Business Innovation Act provide funding support. 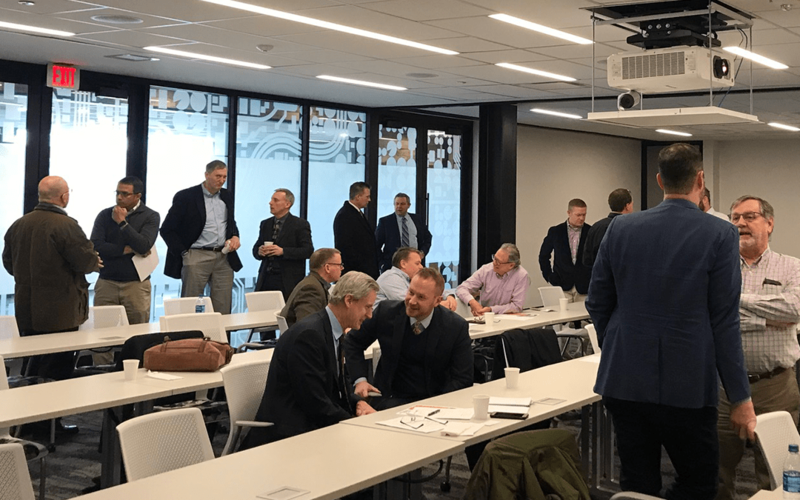 The Startup Collaborative, Roots Ventures Group and the Nebraska Innovation Campus all provide varying degrees of startup support, working spaces and even opportunities to compete for funding. As an entrepreneur with six patents himself, Zeeck is quick to point out that the Nebraska University system is a true asset as an eager and approachable research resource. Our region even has large businesses, such as Farm Credit Services of America, that have taken an interest, and invested in startups to search for new value-ads for their customers. Martin shared FCS America’s latest pitch event, which took place in January at Iowa’s Power Farming Show, allowed startups to pitch directly to producers giving them great visibility and direct access to customer feedback. Businesses and professionals need to move away from a commodity mindset and hone in on what makes each unique, then position ourselves in the market. The desire to keep kids safe is keeping them from gaining exposure to entrepreneurship. A stable job has long been the goal, and startups have been a riskier, even scary, idea. But what if every student across the state had the experience of starting their own business as part of their curriculum, and could graduate from high school with the experience of being a business owner? We should want to raise our students to be inventors, status-quo challengers and employers – not just employees. We can benefit from different perspectives coming together with increased communication between rural and metro. We accomplish more together. It’s a hefty order, but a pursuit worth chasing. So, Omaha, are you ready? Interested in learning more about our Ag Council?